iContact Pro provides marketing automation software and services for marketing teams to drive quantifiable results. The iContact Pro platform integrates email marketing, landing pages, social media management and robust analytics in a simple but comprehensive cloud-based solution that helps customers outsmart the competition and grow their business. 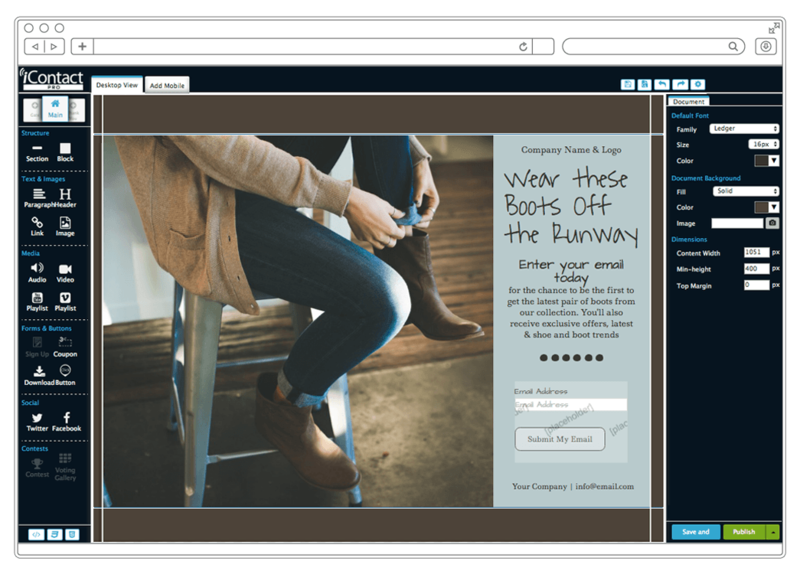 BUSINESS-CLASS EMAIL: Creating effective email campaigns is easy with 650+ professional templates and top class deliverability. SEGMENTATION AND TARGETING: Target your leads based on who they are and how they interact with you. 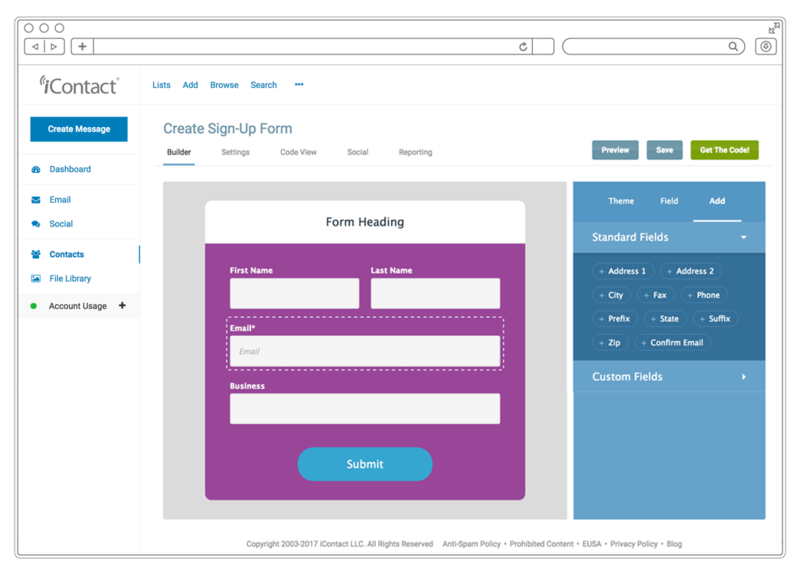 LANDING PAGES: Create great looking, mobile responsive landing pages in minutes. 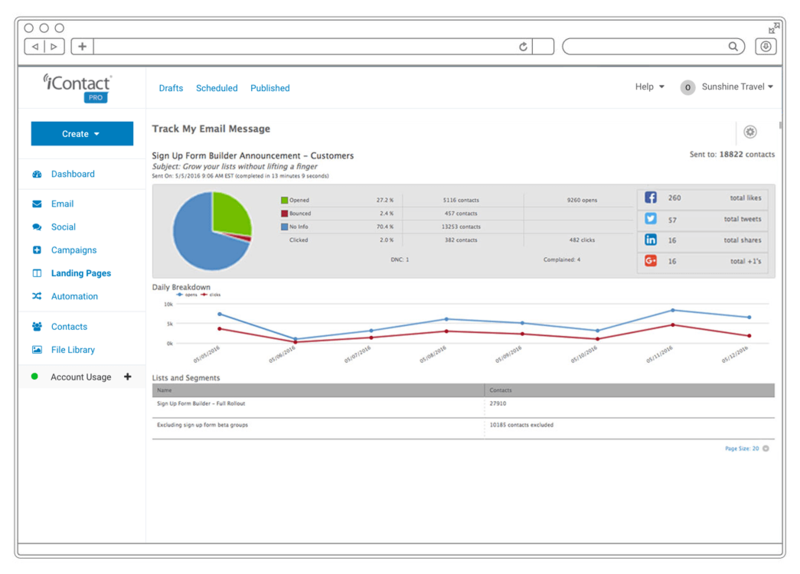 Drive, track, and measure action on email, social, and your website. 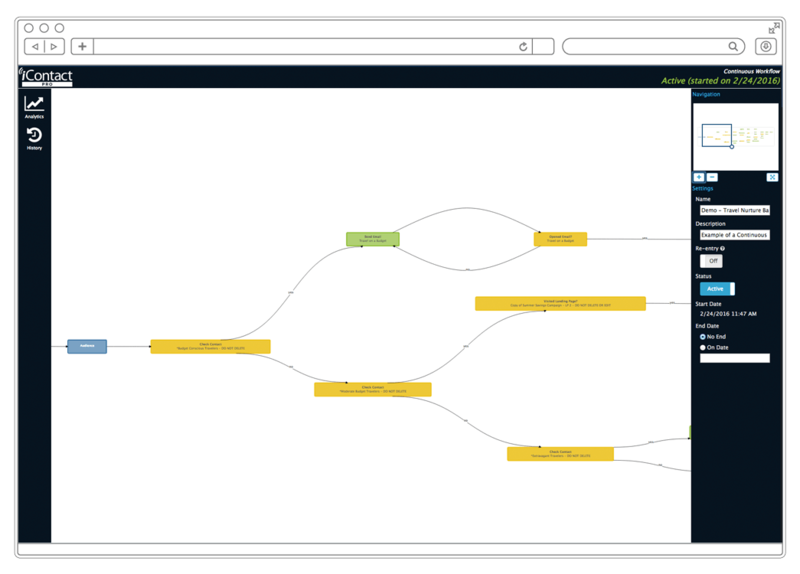 WORKFLOW AUTOMATION: Nurture customers with the right content, at the right time, by creating custom experiences using the most intuitive workflows in the industry. LEAD SCORING: Customize scoring criteria and the software automatically qualifies your leads so you can engage with confidence and increase your marketing efficiency. CAMPAIGN MANAGEMENT: Create, track, and measure your integrated marketing campaigns, from Tweets to email with powerful and easy-to-understand analytics. SALESFORCE INTEGRATION: Sync contacts and leads directly between your Salesforce.com and iContact Pro accounts, so you can quickly and effectively close your newly qualified and ready leads. 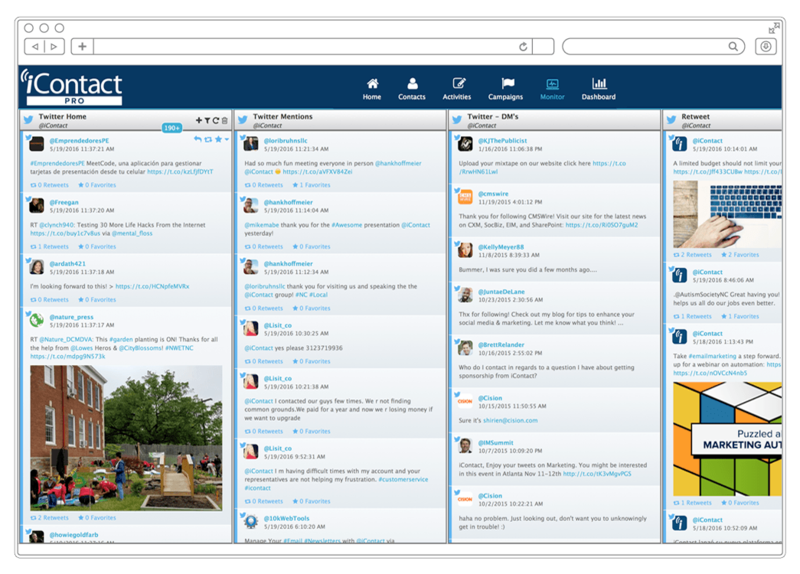 SOCIAL CRM: Track and record every engagement with your prospects across email, social media, landing pages, news releases, and website visits. Nowadays, a marketer’s life is full of long hours, distractions, and beeping devices — it’s time for you to work smarter, not harder. iContact Pro was created to help companies engineer more calculated ways to send personalized communications to customers. No advanced degrees required. Automation is not rocket science. But with most big enterprise solutions, getting started with marketing automation might feel a lot like planning a complicated rocket launch. iContact Pro was built to work fast for any size team, so when you say “yes” to marketing automation, you say “no” to complicated implementation. Simply login, pick an activity, and take off! Email marketing is at the heart of any results-driven strategy. iContact Pro is your virtual segmenting machine, helping you create individual CRM profiles to provide subscribers with the most relatable experiences for them — no matter how they engage with you. Bringing in more leads doesn’t always mean more revenue; prospects demand a higher quality experience from you. iContact Pro helps you nurture relationships throughout the entire customer lifecycle in a way that feels personal, but is in fact highly automated. Reach out to the right people, at the right time, with the right message. Get more mileage from existing content. Turn social fans into subscribers by including links to your own landing pages and invite people to download valuable content in exchange for their email address. Flexible, built-in tools allow you to schedule a calendar of social activity in advance or join in on trending conversations as they happen. Everything you need is now easier to do. 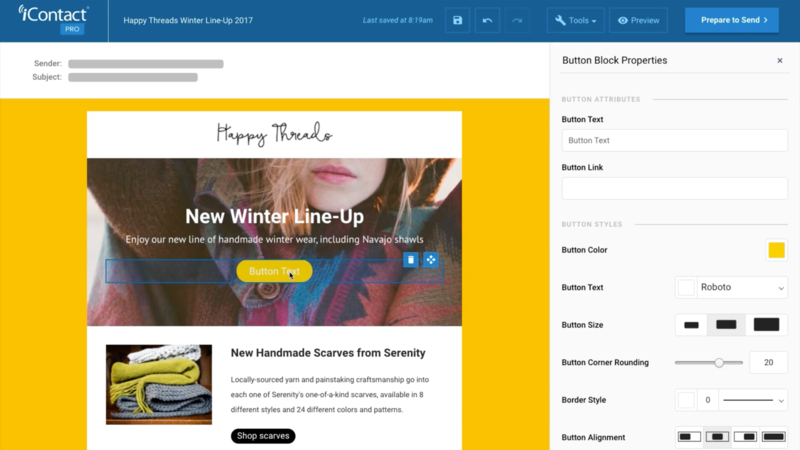 From designing professional landing pages and email templates, to setting up intuitive workflow triggers based on customer actions, our interactive tools make it easy to cross marketing tasks off your to-do list. Great results come from consistently testing and drilling down into your performance data to make campaign tweaks on-the-fly. 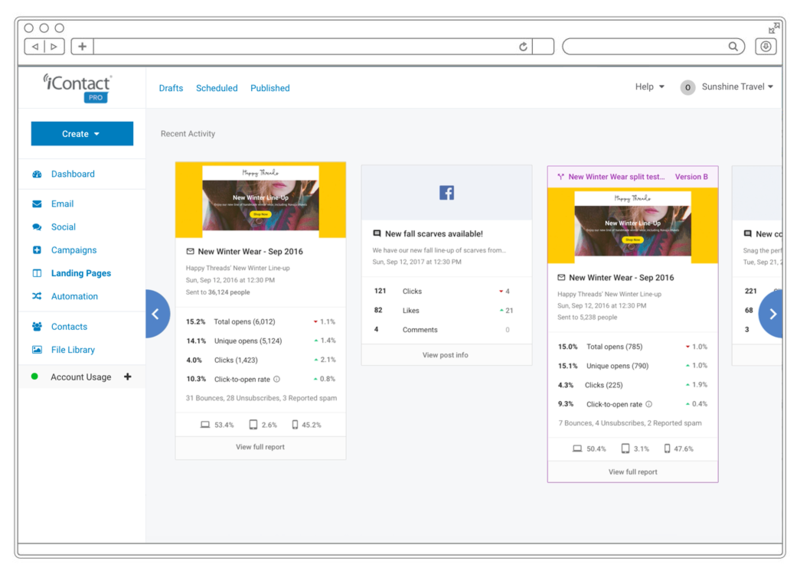 Engagement reports let you count up and compare the success of your social posts, landing pages, and emails. Ask us how you can integrate data from other tools with your dashboard for convenient, one-screen viewing. We’re not doing our job if questions block your way to making things happen on your terms. We work hard to take the guesswork out of success. You can count on our experts and software to flatten learning curves along the way so you can just get up and get going. Hi there! Are you looking to implement a solution like iContact Pro?